OMAHA, Neb. -- A surgeon who contracted Ebola in his native Sierra Leone received aggressive treatment at a Nebraska hospital over the weekend but died Monday morning. Dr. Martin Salia's death is a reminder of how deadly the Ebola virus is and how important it is to receive treatment early, said Dr. Jeff Gold, chancellor of the University of Nebraska Medical Center in Omaha. "In the very advanced stages, even the modern techniques we have at our disposal are not enough to help these patients once they reach a critical threshold," Gold said at a news conference. Salia, 44, was diagnosed with the virus Nov. 6. By the time he arrived at the Omaha hospital on Saturday, he was in extremely critical condition with no kidney function and severe respiratory problems. He was placed on kidney dialysis and a ventilator, and was given several medications to support his organ systems, the hospital said in a statement. He was given the experimental Ebola drug ZMapp on Saturday and received a plasma transfusion from an Ebola survivor - a treatment that is believed to provide antibodies to fight the virus. Letters on "The Ebola Hot Zone"
"We used every possible treatment available to give Dr. Salia every possible opportunity for survival," said Dr. Phil Smith, medical director of the biocontainment unit. "As we have learned, early treatment with these patients is essential. In Dr. Salia's case, his disease was already extremely advanced by the time he came here for treatment." The doctors and nurses treating Salia took additional precautions to protect themselves from the virus because of the advanced state of his disease when he arrived, Smith said. Everyone who treated Salia will be monitored for 21 days for Ebola symptoms, but they won't be quarantined. Salia's body will be cremated as a precaution, Smith said. Two other Ebola patients have been successfully treated at the Omaha hospital. Of 10 people to be treated for the disease in the United States, all but two have recovered. Thomas Eric Duncan, of Liberia, died at a Dallas hospital in October. Salia was on day 13 of his illness when he arrived in Omaha, Smith said. The hospital's two surviving Ebola patients arrived on day six and day eight of their illnesses. Salia's wife, Isatu Salia, said Monday that she and her family were grateful for the efforts made by her husband's medical team. "We are so appreciative of the opportunity for my husband to be treated here and believe he was in the best place possible," Salia said. Ebola has killed more than 5,000 people in West Africa, mostly in Liberia, Guinea and Sierra Leone. Five other doctors in Sierra Leone have contracted Ebola, and all have died. Salia had been working as a general surgeon at Kissy United Methodist Hospital in the Sierra Leone capital of Freetown. It's not clear whether he was involved in the care of Ebola patients. Kissy is not an Ebola treatment unit, but Salia worked in at least three other facilities, United Methodist News said, citing health ministry sources. Salia graduated from the Pan African Academy of Christian Surgeons training program in 2008. A fellow medical missionary, Richard Toupin, of Auburn, Indiana, last week described his colleague as "one of the best-trained surgeons in his country." Bruce Steffes, executive director of PAACS, said Salia was free to practice anywhere he wanted, but that he elected to stay in Sierra Leone where the need for surgeons is immense. The White House also sent condolences in a statement, saying Salia's death "is another reminder of the human toll of this disease and of the continued imperative to tackle this epidemic on the front lines, where Dr. Salia was engaged in his calling." Salia's wife, who lives in New Carrollton, Maryland, said in a weekend telephone interview that when she spoke to her husband early Friday his voice sounded weak and shaky. But she said he told her "I love you" in a steady voice. They prayed together, she said, calling her husband "my everything." 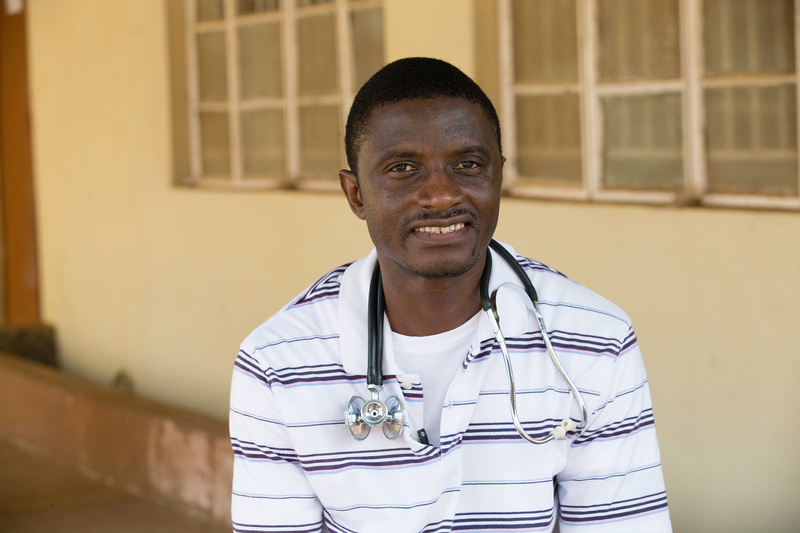 In a video recorded in April, Dr. Salia explained why he felt the need to treat Ebola patients, despite the high risk of infection. "I knew it wasn't going to be rosy," Salia said, "but why did I decide to choose this job? I firmly believed God wanted me to do it. I knew deep within myself, there was just something inside of me, that the people of this part of Freetown needed help." Salia went on to say, "I took this job not because I want to, but I firmly believe it was a calling and God wanted me to. That's why I strongly believe it's God that brought me here to fix whatever comes my way. And I'm pretty sure, I'm confident, that I just need to lean on Him, trust Him for whatever comes in, because he sent me here. And that's my passion."